According to Google’s search engine rankings, only 2 of the top 10 most visited file sharing websites are related to BitTorrent. This isn’t to say that torrents aren’t still popular, but five years ago the situation would have been quite different. Cyberlockers are to blame for this shift in file-sharing habits. They provide a simple browser-based upload solution, often with a premium option for faster downloads and other perks. Thanks to fast Internet, cheap storage and browser advancements these sites are now 10-a-penny. Here are the top 10 file sharing sites on the web, in descending order according to data from Google for July 2011. Officially the most popular site here, 4Shared offers a decent free option for those who are reluctant to reach for a credit card Manage Your Budget & Expenses Using Google Budgeting Tools Manage Your Budget & Expenses Using Google Budgeting Tools Read More . A free account provides 10GB of free storage space which can be used to upload files below 2GB. Interestingly there are also apps available for the iPhone, Android devices and BlackBerry phones as well as an outdated Symbian version too. Premium accounts provide 100GB of space and vastly improved download speeds, and the cheapest I could find started at $6.50 a month based on a year’s subscription. Another massively popular site, MegaUpload provides two free options – non-members and members. Registering a free account is worth it in order to net 200GB of free storage and a maximum upload file size of 2GB. Free membership delivers “limited” download speeds (as opposed to “very limited” for non-members) and an average load of adverts. Premium accounts are available for as little as 24 hours for a few bucks, or you could opt for the monthly plan which comes in at around €10 a month. As you’d expect, premium unclogs your download tubes, removes adverts and all manner of other pleasant things. MediaFire’s free accounts are supported with adverts and pleasantly provide no limits to your total storage or number of files. The drawback? A maximum file size of 200MB. The cheapest premium option costs only $9 a month and removes all those adverts plus allows for files up to 10GB in size. You also get 100GB worth of direct/hotlinking to your uploads, which you can share with anyone for instant download goodness. Not a cyberlocker, but a search engine which scours other cyberlockers and returns the results in one easy to find place. Not a bad solution if you’re looking for something elusive, although the lack of an upload option makes this a bit of a one-trick-pony. A free membership allows you to upload all you want, with no restrictions. That’s right – unlimited file size and unlimited storage for free! However, if a file is not downloaded within 30 days it is earmarked for deletion – so be warned. Premium accounts start at around €10 for a month’s access and removes this 30 day limit, as well as the usual download speed restrictions. A public torrent tracker currently indexing over 3.5 million torrents in a variety of categories. Be sure to take care if you do use public trackers – you never know who might be watching. Check out our article 5 Best Tips to Prevent Someone From Watching You When Downloading Torrents 5 Best Tips to Prevent Someone From Watching You When Downloading Torrents Read More for further advice! 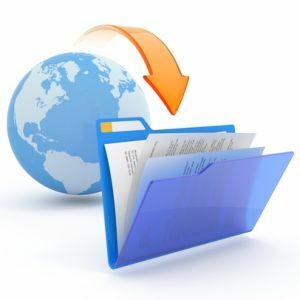 Another cyberlocker for all your uploading needs, FileServe provides free accounts that are good for files under 1GB. The site says that split archives are allowed too, so with some clever archiving The Top 3 File Compression & Extraction Softwares The Top 3 File Compression & Extraction Softwares Need to compress a large file? There's no shortage of file compression and archiving apps for Windows. But which file zipper is best for you? Here are our three top picks. Read More you should be able to overcome the size limit. Premium accounts are competetively priced and remove download/speed limits and increase the size cap to 2GB. A relatively average site, only allowing for files up to 400MB to be uploaded for free. Split archives are fine, and the free option is supported with the usual advertising. A premium account will cost about $9 and for that you get 100GB of direct/hotlinking, unlimited downloading and an advert-free browsing experience Use Adblock To Block Online Ads and Malware Use Adblock To Block Online Ads and Malware Read More . Torrentz is a torrent search engine which queries a lot of other trackers and returns all relevant results on one page. Clean, quick and minimalistic, Torrentz is a no-fuss search engine designed to check elsewhere so you don’t have to. Deposit Files is the least popular of all the file sharing websites on this list, yet has an incredible free option. With maximum file sizes of 2GB, unlimited storage and no deletion policy, this host is a beast. The site’s layout is clean and not littered with distracting adverts and there are a variety of ways to upload including queuing up multiple files. Granted, as a free user your download speeds will be limited, but for around €9 a month, you can lift those limits. So the cyberlockers overtook BitTorrent trackers as the most popular file sharing option out there. It’s not all pirated movies and cracked copies of Windows – these services are useful for backup, collaborating or quickly spreading your work. Of course I’d be lying if I said that piracy didn’t make up the majority of traffic, ad revenue and downloads these services receive. What do you think of these sites? Any personal favourites? Any hidden gems? Any horror stories? Share your comments below! I recommend iFile.it (formerly mihd.net). Very user-friendly, specifically Free users as it does not even offer a "premium" feature as of yet. :) Direct linking, most any file types, generous file size limit (1GB per file -- split archives allowed), and according to their FAQ, you can upload "as many as you want :)". I noticed you didnt mention Demonoid! Why is that? I love Demonoid for the fact that 99% of the material is legit and virus free! It also has it category based so its easier to find the content that I want! Of course it is by invite only but that helps me feel more comfortable with the types of people that are sharing and downloading. Demonoid is pretty big, but according to Google's data nowhere near as big as some of these cyber lockers. I'd imagine the fact that Demonoid has now gone semi-private will affect the rankings a bit too. Very solid, informative article. I linked to your article from my blog.